In the Myers-Briggs family of personality types, INFJs and INFPs are like siblings. Both personalities are highly emotionally intelligent, and it seems they were put on this planet for the same purpose: to help everyone else understand the human condition in a profound way. These two rare types are so similar that it can be hard to tell the difference between them. Many INFJs mistype as INFPs, and vice versa. 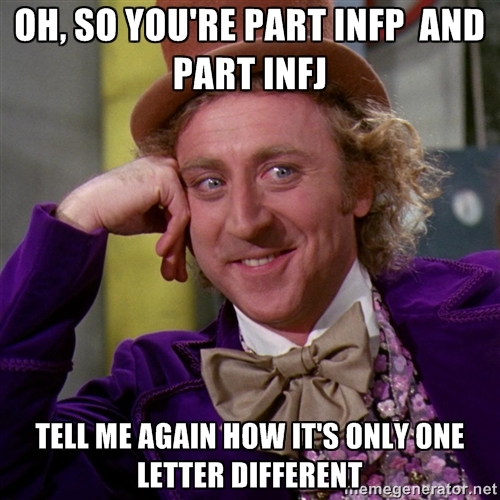 At first glance, it looks like the INFJ and INFP have everything in common except the last letter of their four-letter type name. But really, these types are like opposite sides of the same coin. One of their biggest differences is how they make decisions. Similar letters, but opposite functions. These two personalities don’t share any of the same functions, explains INFJ blogger Megan Malone in her post, Type Analysis: INFJ or INFP? “Functions,” in Myers-Briggs speak, are the preferred ways of thinking a given personality type uses to gather information from the outside world and make decisions. These two types are similar in many ways because they’re both introverts who use feeling and intuition as their top two functions. Their differences come down to the order and the direction of their functions — the INFJ’s intuition is introverted and feeling is extroverted, while the INFP’s intuition is extroverted and feeling is introverted. Both types look inward to make decisions. Because they’re both introverts, INFJs and INFPs look inward to make decisions, but they look at different things. INFJs make decisions by waiting for introverted intuition to make things clear by providing them with sudden “aha!” moments, explains personality profiler Antonia Dodge, co-owner of Personality Hacker, in her post INFP vs INFJ: 5 Surprising Differences to Tell Them Apart. They use different functions in the decision-making process. Introverted intuition, the INFJ’s dominant function, is a learning process that works by watching one’s own mind form patterns. After years of use, introverted intuition sees the “pattern of patterns,” so to speak, and INFJs understand that what is happening inside them cognitively is also happening for other people. The INFP’s go-to function is introverted feeling, which works by being deeply in touch with how events emotionally impact the INFP. Both can struggle to make decisions, but for different reasons. The INFJ’s introverted intuition is a perceiving process, which means it’s a function that gathers information. Decisions are made using a judging process — either a feeling or thinking function. So, INFJs must use their second function, extroverted feeling, to make decisions. Using a secondary function is not as easy as using a dominant function, so INFJs may struggle with indecisiveness if they haven’t developed extroverted feeling well enough. INFPs want every decision they make to align with their personal values and identity. A decision as simple as what to order at a restaurant can become a frustration if, say, their relationship with food has become a part of how they define themselves, explains Dodge. It can be grueling for INFPs to be pressured to make a quick decision, because they haven’t had time to evaluate how the situation fits with their values. It’s only through checking their own visceral emotional reaction that INFPs know how a decision aligns with them, so usually they don’t know if a decision is right for them or not until after they’ve made it. However, each decision and its emotional impact is catalogued in the INFP’s mind, and little by little, decisions get easier and faster. Because INFJs are more removed from their decision-making process, they don’t struggle as much with day-to-day decisions, because not every decision is a reflection of their identity. Thanks to introverted intuition, INFJs can see problems from many different perspectives. Being able to see too many sides of an issue, however, can make it difficult for INFJs to make a final call. Further complicating the INFJ’s decision-making process are the feelings of other people involved in the situation. INFJs take other people’s emotions into account just as much as — and sometimes more than — their own emotions. INFJs strive to make decisions that are win-win not only for themselves, but also for any other people involved (although this isn’t always realistically possible). As always with personality psychology, keep in mind that your own experiences, circumstances, and willpower shape who you are, and no two INFJs or INFPs will be exactly alike.